This is the story of a costume that I built for a one-woman show. 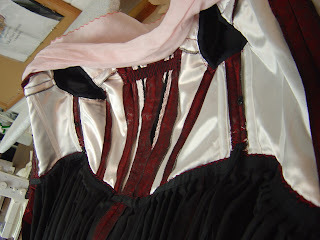 I sewed every item, from the corset to the over-dress. Let me begin with a pretty, pretty picture. 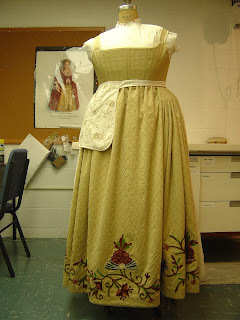 This is the underskirt in production--note the line of basting an inch from the bottom and that one of the flowers is pinned to the fabric on the left. 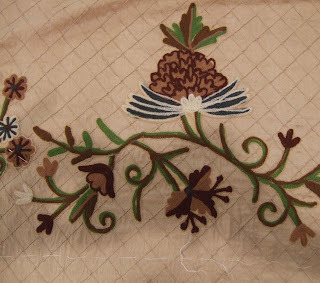 In a very lengthy process, I cut the flowers from one fabric and appliqued them onto this fabric (beige with the diamond pattern). 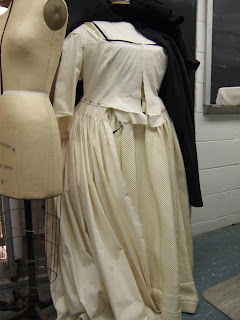 All of this before actually making the underskirt, which was eventually backed with muslin and cartridge pleated. 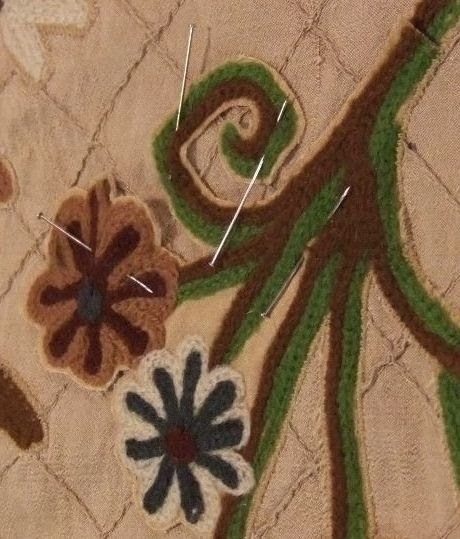 In order to appliqué, I would select a section, roughly cut it, fuse it to another fabric and then closely cut out the vines and flowers (leaving about 1/16th inch for sewing). Fusible is fabric with glue on one side, used to stabilize, stiffen and prevent fraying. Finally I arranged my selected vines and flowers on the new fabric of the underskirt, creating a pleasing asymmetrical-symmetry. My favorite new term. A very long view of the underskirt still in process (I eventually filled in both ends), to give a better idea of the full length of the appliqué design. 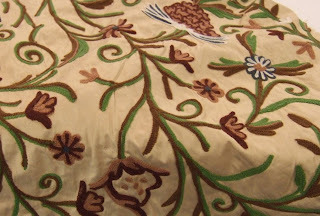 And a close up to show the pins and the fabric in process. 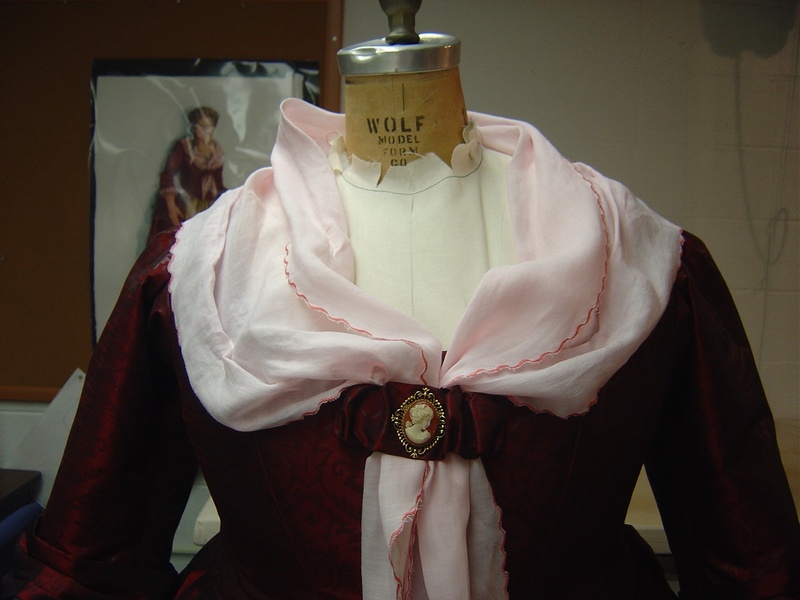 For those outside of Costume Land, a "mock-up" is a muslin version of a potential garment that is fitted to an actor. This is the test-run for the pattern, which will be changed after the fitting and before the garment is cut from the real fabric. 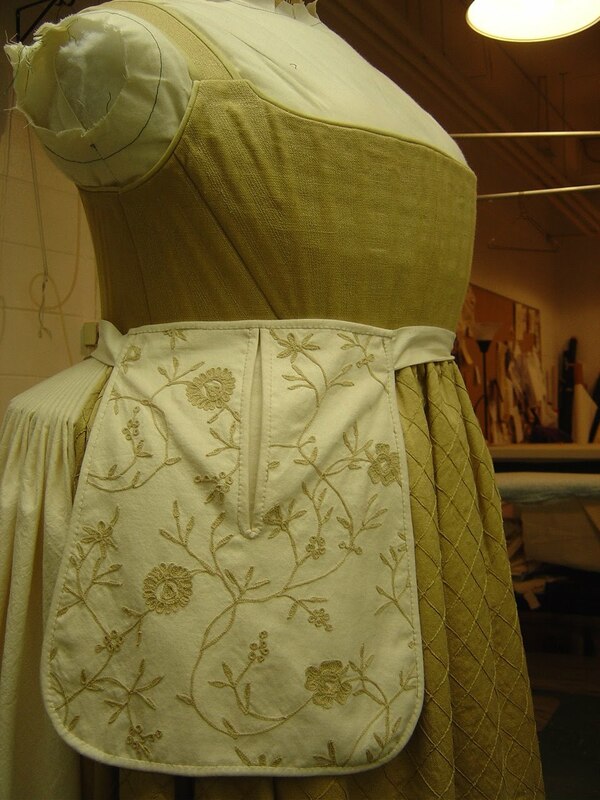 On the left, featuring a muslin bodice, skirt and sleeve is the early version of this mock-up. It has a white underskirt from stock that was used in the draping process. On the right, featuring a satin bodice, is the mock-up that was used in the fitting. 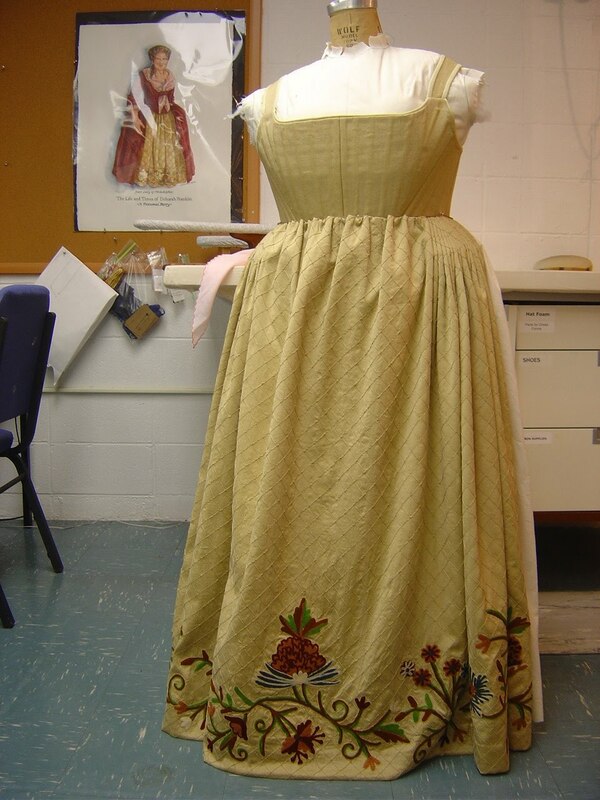 Note the appliqued underskirt that will be part of the final ensemble. The mock-up has a cartridge-pleated skirt and only one sleeve for the fitting. These cartridge-pleats were later replaced with regular, flat pleats. 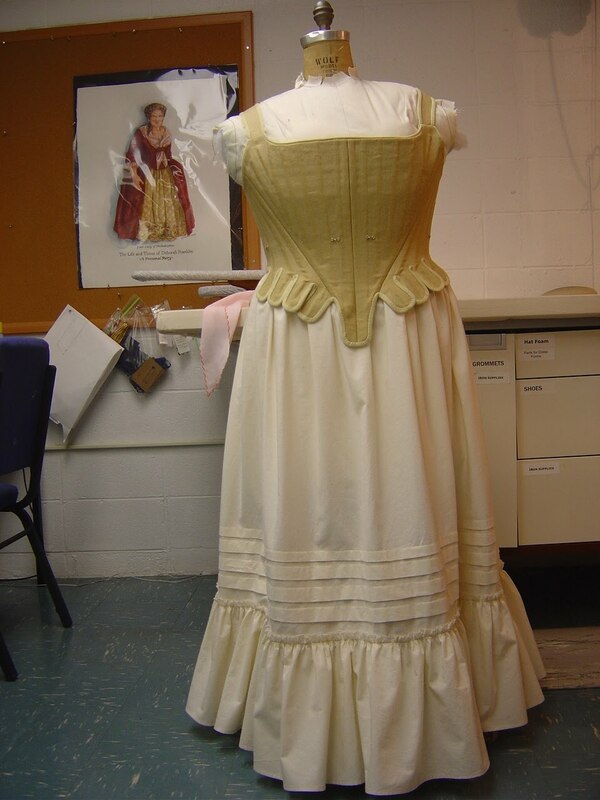 The actress wears a sleeveless t-shirt under her petticoat and corset. The petticoat has tucks to allow for future use by taller actresses. 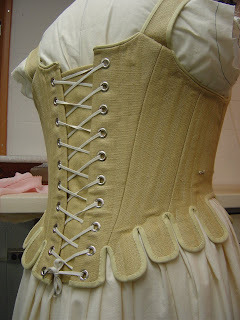 The corset is a layer of coutil to which the bones are attached. This is flat-lined to a layer of linen (the visible fabric) and lines of closely-spaced stitching provide extra stability. There are even bones in the small tabs along the lower edge. 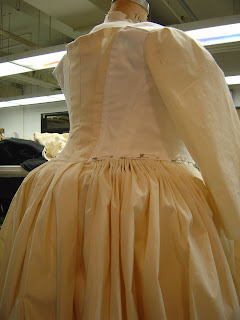 The visible metal center front are bars for the hooks on the underskirt--these helped the actress keep her skirt at her waist and also helped to line up the center front. 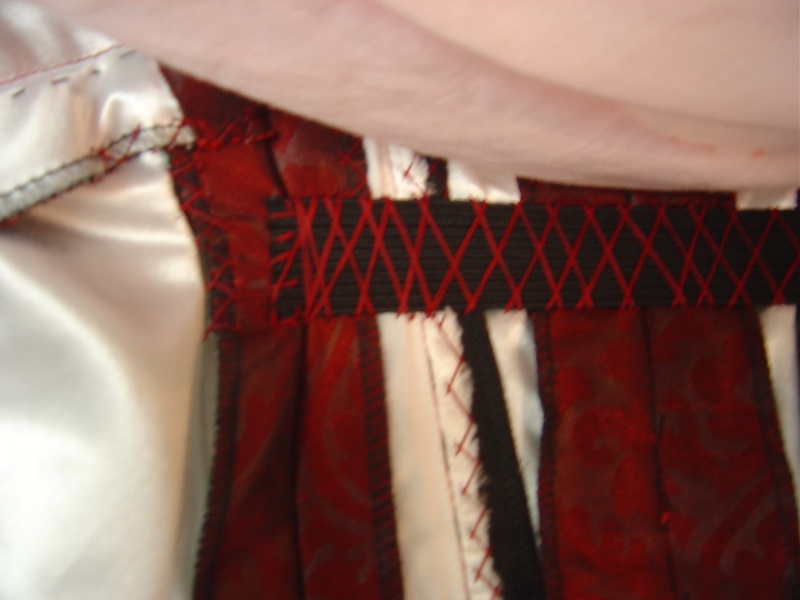 For those who care, note that I did not lace this corset correctly. I wanted the image to be clean (no strings attached), but a corset should be laced from the top and the bottom with two knots at the waist where all the laces meet. To show off my beautiful stitching. And the piping around the neckline, sewn by hand on the interior. The lower edge of the corset is edged with bias tape, stitched on by hand because of the boning and the tabs. I ripped my fingers apart sewing through so much stiff, boned, material. Yes folks, that is the official term, a bum roll. 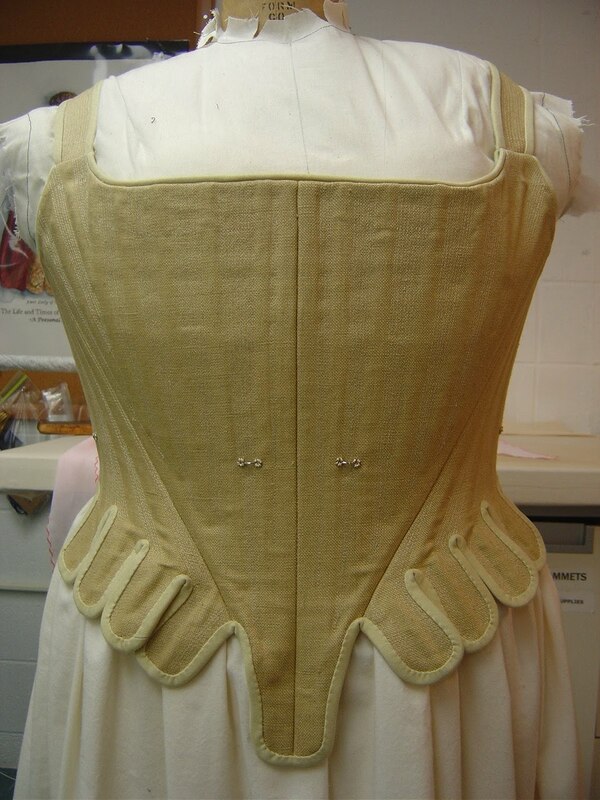 This is worn around the waist, on top of the petticoat and corset, beneath the underskirt and over-dress. A bum roll is crescent shaped and tightly stuffed, worn with the largest part towards the rear as implied by its name. 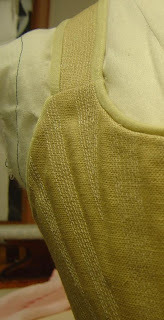 This provides support for the cartridge-pleats of the underskirt. 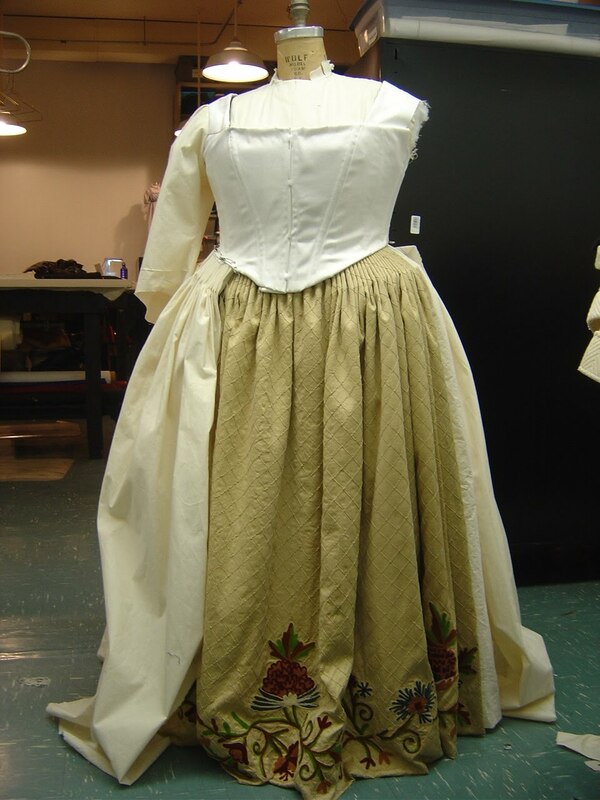 Here it is again on that underskirt, finished, flat-lined to muslin, cartridge-pleated and mounted on a waistband. Note that this underskirt is only gathered at the front, not fully cartridge-pleated. 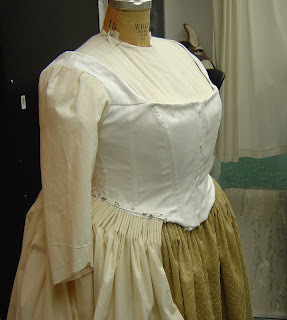 And all this was possible because originally pockets were completely separate from the garment and were worn over the underskirt, under the over-dress (which sometimes had a hole to allow access to the pocket). And they were actually bigger than the one that I made... think of the pocket as a purse for all valuables. 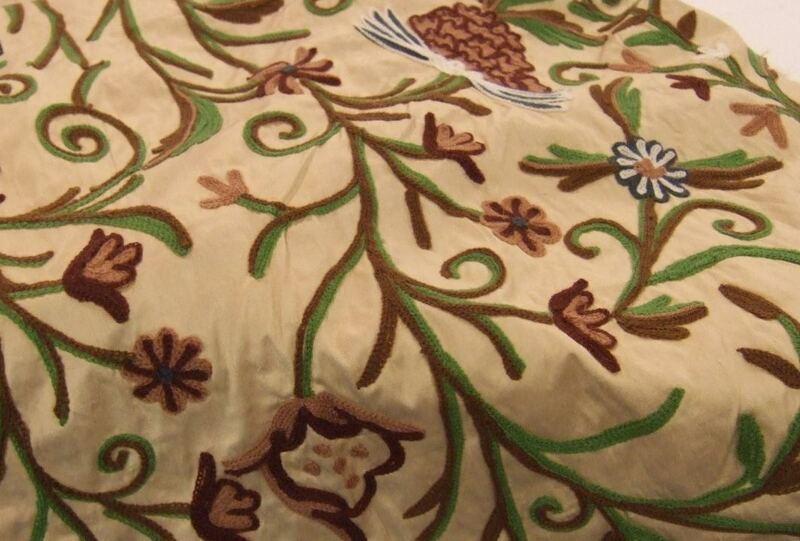 Some pockets were highly decorated, others very simple, but all were functional. 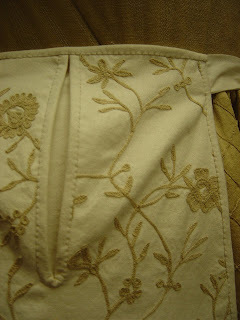 If you want to see more pretty pockets that inspired me to make this one, go to the Pockets of History page. I did not embroider this pocket, but I did hand stitch the bias-binding to give it an authentic flavor. I have not yet described the bodice construction... remember that white satin fabric that was the bodice of the mock up? Well, those same pieces were the interior layer of the bodice of the final garment... I flat-lined the satin to a layer of black pocketing and a layer of the red fashion fabric. 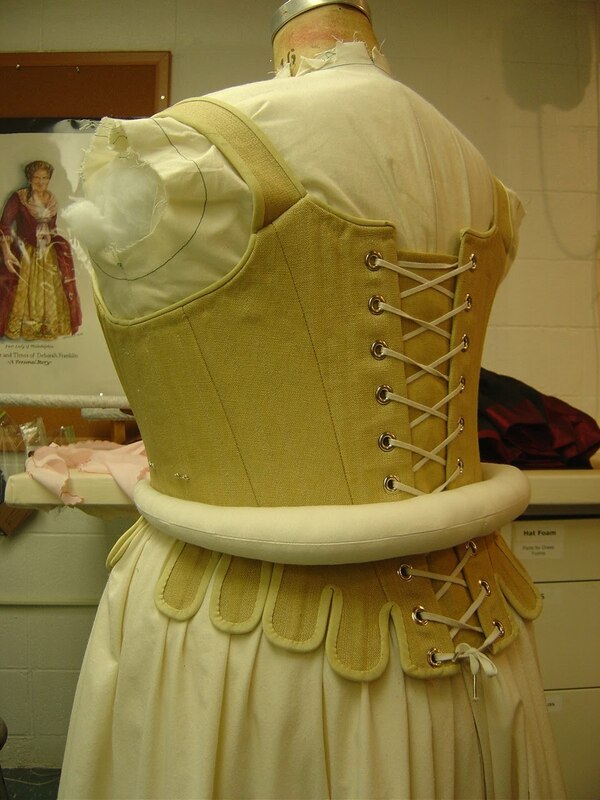 There were a few bones sewn to the white satin, just to keep the bodice flat and stable. 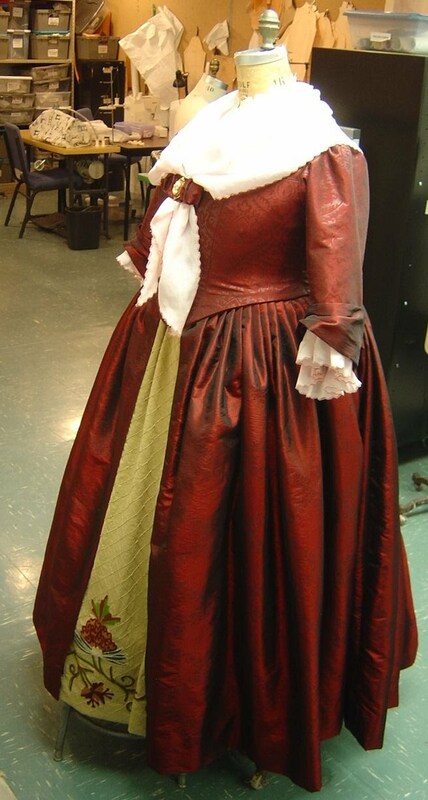 The skirt was essentially four large square pieces of black fabric flat-lined to the red fashion fabric and pleated into a grosgrain waistband and then hand sewn into the garment. The inside of a garment often shows more of its history than the outside... it also often takes longer to "finish" a garment than it does to put it together for a fitting. Here is the inside, fully finished... the seam allowances are pressed open and cross-stitched down, the armscye is finished with black cotton bias tape and there is a strip of "ballet" elastic in the center back between the shoulder blades to hold the garment snug to the actress. The last details were the addition of a delicate pink fichu, matching engageantes and the elasticated band with a decorative cameo brooch.